The brief was to provide modern and visually attractive provisions that were not only capable of serving the 7,000 plus student community, but also reflect the sophisticated design of college. After developing colourful and creative designs to meet such criteria, Washroom Washroom was then tasked with manufacturing and installing the complex specifications, which included cubicles, vanity and towel units, grab rails, soap dispensers and bins across seven floors of the college. A stunning design feature of the newly installed WC areas was the carefully selected choice of bold colours to create a contemporary theme running throughout the modern college. Provisions were specially designed in a mix of black Solid Grade Laminate (SGL) juxtaposed against bright orange glass to create a vibrant statement in the bespoke washroom areas. Washroom Washroom worked closely with the college and the main contractors to create the chic look, which comprised of stylish Forte WC cubicles and Concerto ducts manufactured in hardwearing SGL to provide a long lasting cubicle option. Adding continuity to the design of washroom areas, Arpeggio vanity ducts sustained the black theme, manufactured from SGL, with contrasting glass lids in bright orange featuring as the unique focal point of washroom areas. 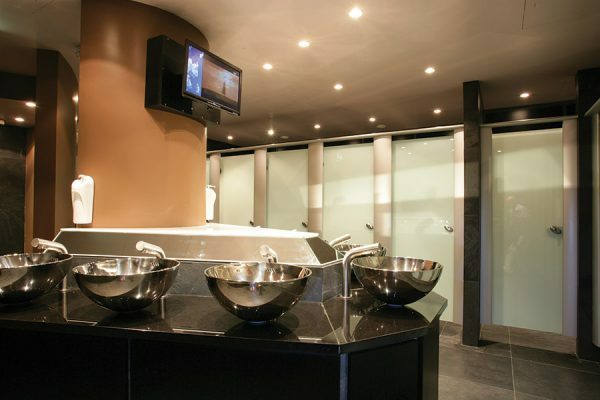 To complete the distinctively designed WC areas, Washroom Washroom installed soap dispensers, grab rails for disabled assess and rubbish disposals to create a stunning washroom space immediately available for use.